Baltic Essentials carries a wide variety of jewelry for children, adults and pets too! The collection includes Baltic Amber and Hazelwood designs that are very trendy and are known to aid in teething pain and other ailments. All jewelry comes with an authenticity guarantee. 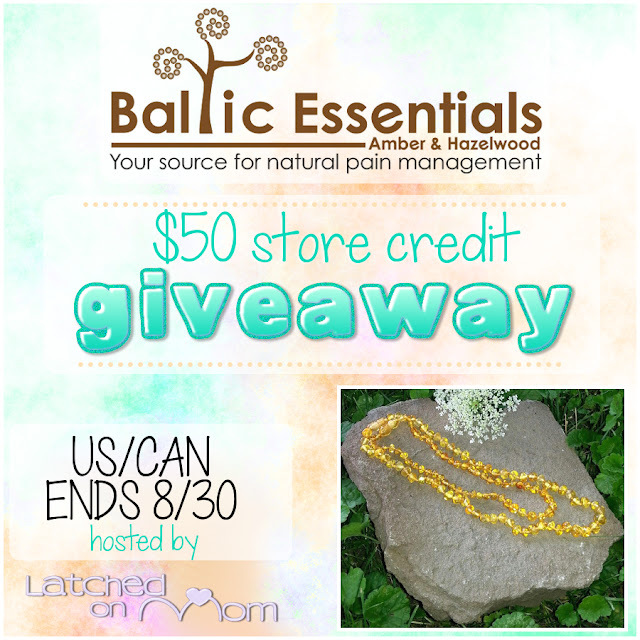 You can read more about Baltic Essentials by visiting the review by Latched On Mom HERE. I think I would choose the Raw Cognac Cherry Baltic Amber Necklace!! I love the cloudy look of it!! So pretty!! I think my favorite is the Hazelwood. They are all nice. No! But i have a friend who swears by amber, so I think amber would be the best one for me! I'd pick the "Adult Polished or Raw Cherry & Purple Amethyst Baltic Amber Necklace 16 or 18 inch." Have not had the chance yet to try Hazelwood,but have read about all the amazing benefits it gives. I'd definitely try wearing a hazelwood piece. The products I would choose are the 11 inch Pink Rose Quartz Hazelwood Necklace for my baby girl and the Baltic Amber polished lemon Pink Rose Quartz 17-18 inch Necklace for me. Great products,love the wide variety. I have a baltic amber anklet for my ankles that works well except it is not the thing to wear while sleeping unless you want some impressions! I'd love to get a necklace in baltic amber and try the hazelwood for my sister with Eczema! I have used baltic amber while my daughter was teething. It seemed to help!